Om and Meena Khanna moved to Truro in 1959, where Om was a high school advanced math teacher for 35 years; he retired in 1994. Besides raising her family, Meena kept busy volunteering in local nursing homes and driving seniors to appointments. Om and Meena have three children: sons Sanjay and Shervan Khanna, and daughter Saneha Reene Goyan. They are proud grandparents to 6 grandchildren. 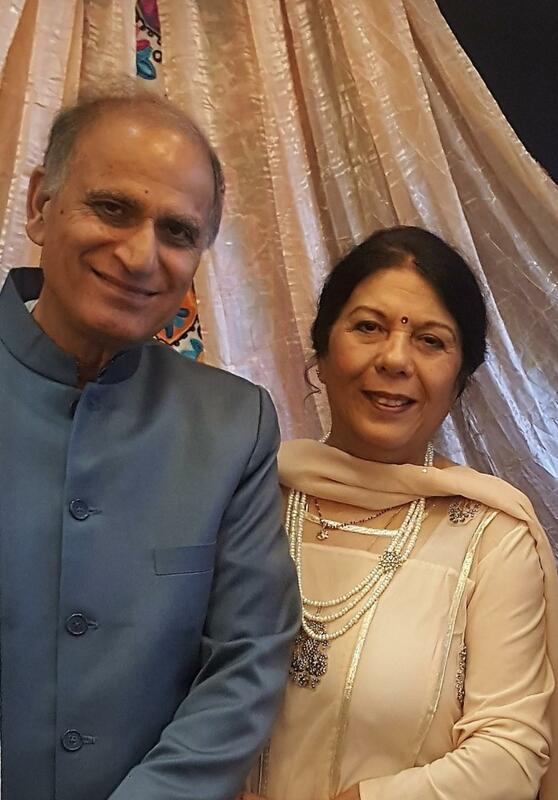 In 1973 Om and Meena started investing in real estate and they now own many successful properties. At present, Om and Meena are constructing a new apartment building in Truro. The Khannas approached the Rotary Club of Truro with the idea of the club joining with them and friends to host a cultural event in Truro. They had been in the community for many years and wanted to give something back. They wanted to raise money for the club to donate back to worthy children’s charities, and other community causes. The idea for a Bollywood Dinner and Dance with both East Indian and Canadian entertainment was born. The event has been very successful and has sold out for the past 5 years. Each year the Khannas have sold a majority of the tickets themselves. In the first three years they made their own appetizers, at their expense, with the help of their friends. Each year they decorate the venue and in recent years a popular photo-booth has been added. They have generously provided the event staff and Rotary volunteers with East Indian clothing and decorations to wear. They have also donated silent auction items each year for the event. The event has been jointly emceed by their son, Sanjay Khanna and a Rotarian. This has given the Rotary Club of Truro the opportunity to highlight what our Club has done for the community over the previous yea. At the same time, Bollywood has become a great cultural event for the community. They, together with their son Sanjay, started a similar dinner in Halifax with proceeds for the IWK. It ran successfully for 2 years. Over time the event has evolved to include a silent auction, games and has featured event sponsorship. Revenues continue to grow. From initially raising $6,000 for children's charities in the first year, the Bollywood event netted approximately $20,000 last year. In total, the Khannas have helped our Club raise over $50,000. At the same time, they have helped spread the word about Rotary and promoted better cultural awareness within our community. The Rotary Club of Truro is pleased to recognize Om and Meena Khanna with the Rotary Community Service Award for 2018-19.